They say great achievements involve great risk. In a food processor, grind the graham crackers until they are crushed into very fine crumbs. Add in flour, baking soda, baking powder, salt and cinnamon and pulse until well combined. In a large bowl, whisk together eggs, buttermilk and vanilla extract. Stir in the flour mixture until pancake batter is well combined and has a very slightly lumpy texture. Heat a large nonstick pan or griddle to medium-high heat. Dollop batter onto pan and cook until golden, then flip and cook the second side until golden. Pancakes can be made any size; I aim for 4-5 inches across. Cook all the pancakes (approximately a dozen 4-5 inch pancakes) and set aside on a cooling rack. Preheat the broiler. Arrange 2/3 of the pancakes on a baking sheet . 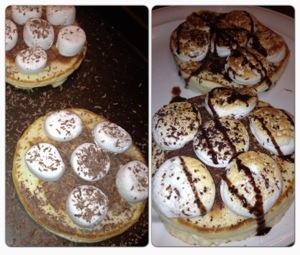 Cut marshmallows in half and arrange evenly on top of the pancakes. Top each with about 1/2-oz dark chocolate. Slide tray under the broiler and cook until marshmallows are toasted, about 1-2 minutes. 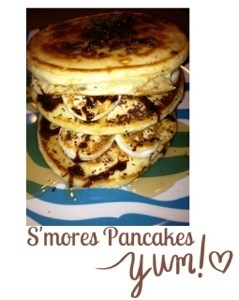 When they are toasted, immediately stack them up 3 high, topping two marshmallow pancakes with a plain pancake. 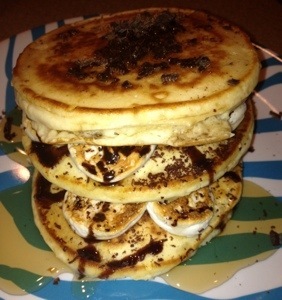 Serve immediately, topped with remaining chocolate and maple or chocolate syrup. Enjoy!